Today's the highly feared day... In a couple of hours I'll be 'running' in the Stiletto Bloggers Run among Kim, Kim # 2, Kim # 3, Afrodite and Hanane and Farah from Fashion Fabrice. Here are some quick outfit shots of what I'll wear during the run! Of course, I'll post a full report of the Stiletto Bloggers Run ASAP! Gotta run (literally), talk to you later! Hoe ver moet je lopen? @ Affreux: Het is een leggingachtige jeans, dus dat valt mee, haha. Ik moet 300m lopen! O jee, liever jij dan ik. Het zou me nog geen 5m lukken :). Veel succes! Looking lovely! Want the jeans tooo!! you rock girl, love love the red jeans and the amazing adorable blouse. fabulous with the leather jacket and black shoes! Good luck for the run, Love your jeans. Je ziet er super uit! 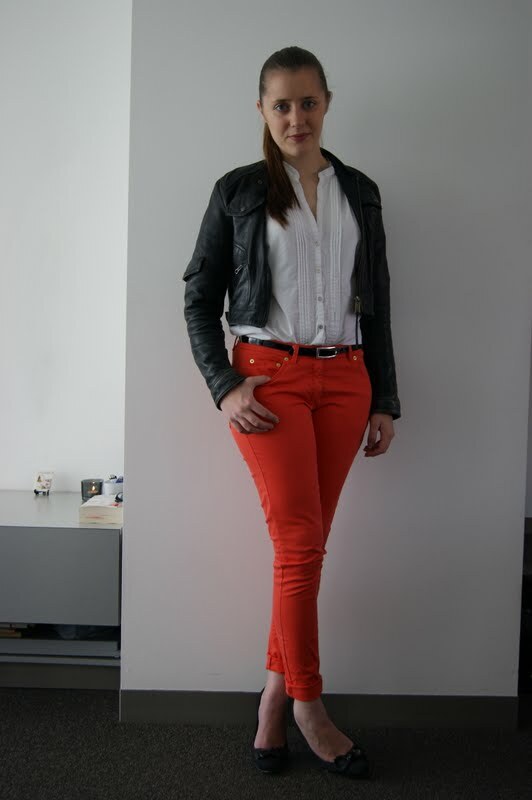 Die rode broek is geweldig! Love the pants! Very curious for the stiletto blogpot aswell! ouch! and good luck. you look gorgeous by the way. En en en , hoe was de run? I am all about the color of those pants.. and that jacket, I want one! Haha..
What fun...and a great look!